What is there to say? Surely there will be speculation about the real reason for leaving. Speculators should start with his stated desire to play quarterback. That must mean he was going to be denied the chance to do that here. 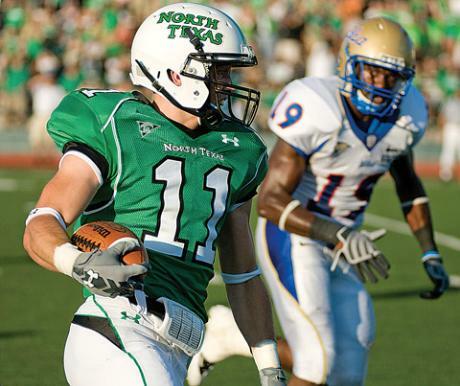 Did Danny Mac or Mike ‘Third Person’ Canales tell him he was going to be a wideout this season? If that is the case, I don’t want to let our admiration get in the way of good personnel decisions. There is no doubt Riles can play some quarterback. With some coaching and more reps, he might have even been a good one. The decision (assuming there was one made) to not have him at quarterback says that Danny Mac and co. think we have some better ones. The dude had heart. Of that there is no doubt. Would only that he didn’t have to put it on display so often in such a short time here. The guy was frail. Fraily Dodge. The Woman said he was like Tiny Tim out there and that she felt so bad for him when he was knocked out of the Kansas State game. That pretty much sums up the short time of Riles at UNT. Hope he goes to SFA or wherever and has a good time, puts up some good numbers and doesn’t get beat up. Maybe it’ll do him good to be playing with guys that are a little more his size? I know all this sounds disingenuous. Ignore that and just know that I was really rooting for the guy to do well. Next: Next post: Who will replace Riley Dodge?